Is Kite Skiing/ Snow kiting/ Kite Snowboarding hard? The level of difficulty in snow kiting depends greatly on your level of commitment. If you're only interest is in "trying" snow kiting then you are already at a disadvantage. To be a successful snow kiter you have to "want" to be a snow kiter. The initial drive and willingness to work are what will make the difference between success and disappointment. Snow kiting, like any activity, gets easier with practice. Being a good skier or boarder is a tremendous asset but you don't have to be an expert skier or boarder to become a snow kiter. However you do have to have a solid grasp on how to set and hold an edge on a ski or board. Initially, snow kiting can be difficult. Hiring a qualified instructor is an important first step to making snow kiting a lot less work, a lot more fun and getting into it safely. If you follow the instruction we provide you will quickly evolve into a self sufficient kiter but a certain amount of dedication is required. At Hardwater Kiting our mission is to provide instruction focused on giving you the skills needed to be safe and have fun in a New England snow kiting environment. To be clear we don't offer a "Disney" experience and snow kite lessons aren't like a trip to the tubing park. This is a wind sport and takes a certain amount of skill and dedication to become good at. With our instruction learning to snow kite is much easier and safer than learning on your own or from a friend. The beauty of snow kiting is the more you fly the better you get, the better you get the easier it gets. The easier it gets, the more fun it is. The more fun it is the more you want to fly! Snow kiting, like any sport or outdoor activity has inherent risk. To participate in this sport safely you must have at least the minimal level of qualified instruction. Trying to learn from information on the internet or from a video is no substitution for learning from a trained instructor with years of flight time and local experience. Flying a kite is only a portion of what you need to know to do this safely. Having the ability to recognize not only the wind conditions but surface and surrounding environmental elements is critical to safely flying a kite in the wintertime. "Isn't it an extreme sport?" is a common question. There are some who prefer market snow kiting as a new "extreme sport", a label we feel is misleading and actually hurts the image of the activity. Snow kiting is no more or less "extreme" than lift access skiing. It can be as extreme or casual as you want to make it. Snow kite L​essons can reduce the risk considerably and every second you get to ride, practice what we've taught you and gain experience reduces the risk further. Power kites are NOT toys. Where are lessons held and why "Lake Based"? Hardwater Kiting has 40 launch sites within a 40 minute drive of North Conway so we operate at various locations. Factors such as wind/surface conditions which can vary daily, determine where the lesson takes place. A lesson location will usually be determined the night before or even the morning of the lesson as weather models can change quickly. We use our 15 years of riding experience to determine the best location for the day. Most lessons will take place on lakes as they generally provide the best conditions for both wind and surface in addition to having plenty of space to ride compared to limited land based riding in the region. 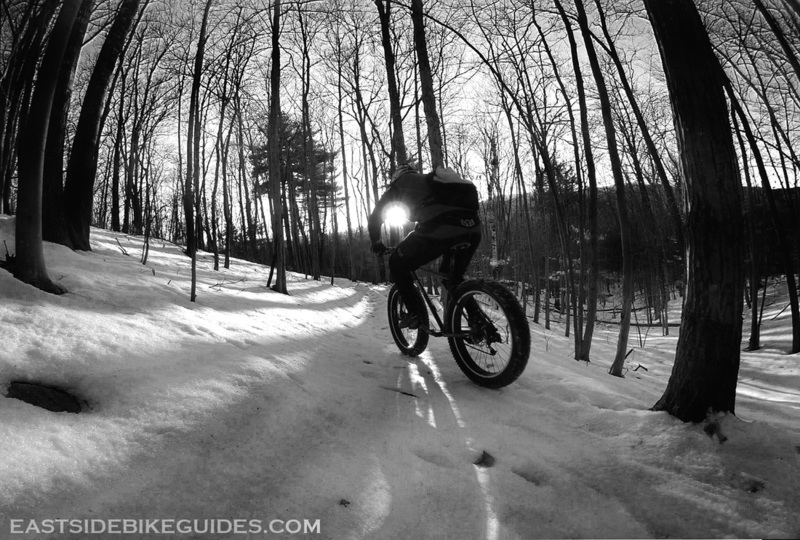 As opposed to a soccer field or golf course where you are riding back and forth on a small patch of land, frozen lakes have the widest open spaces in New England and provide the most consistent and steady winds found inland. We find that snow kiting offers an excellent way to tour these lakes and see things that you never see in the summer or when powered by a motor. Every lake has it's own personality and that personality changes with wind and/or surface conditions. In general you wear the same gear that you would wear if you were going lift access skiing/ boarding. A helmet and goggles, gloves, ski boots, warm jacket or warm under layers and shell. Hand warmers are a good idea on the really cold days. Hardwater Kiting provides all kite equipment (kites, harnesses and ice screws, etc.) We use the best, safest and up to date kites available. Bring your skis/board and your helmet and hand warmers if needed. We do not supply skis or snowboards but we are partnered with some local ski shops that can supply rentals for a fee. Students should bring something to drink and something to snack on and students taking the full day lesson should bring a light lunch. Hardwater Kiting will be on site ready to start between 8:30 and 11:00 am depending on lesson type and on the forecast. It is rare for the local wind to start earlier than this and it allows time for set up and inspection. We will contact our clients prior to the morning of the lesson to confirm the lesson location and briefly go over where to meet and what to expect for the day. Full day lessons will have a half hour break for re-hydration and snacks. We want to remind people to please be punctual. Lesson time starts when we arrive on site. Due to the time of year restrooms may not be available on site. However when possible there are restrooms available nearby at local businesses. We recommend that you "go before you go" and if you do need to take a break at a local business that you patronize that business while using their facilities. You can use either skis or snowboards for snow kiting. For students just taking their first lesson/ground school we recommend skis, even if you are a snowboarder, as they offer the more mobility and ease of use when learning to fly the kite. After you have gained the flying skills needed to be able to move on your own you will find that those skill translate perfectly to both skiing, boarding and kite surf. We find that in our local kiting environment skis are far more versatile for kiting. As each lesson description states, YOU MUST BE AN INTERMEDIATE SKIER OR BOARDER. Ski/board instruction is not within the scope of our lessons and you have to have a basic knowledge of how to edge a ski or board to make the most of your lesson. Any time we have to spend instructing ski/snowboarding is time taken away from your kite instruction. Can I use the same kite for snow and water? Yes, depending on the kite. There are various kite designs and some are better suited to one environment than the other. We prefer foil kites, both open cell (land base use only) and closed cell (land and water usable) as they are tough, reliable , light weight and easy to manage in a winter environment. Leading Edge Inflatables (LEI) aka "Kite surf Kites", are usable for snow use but pose some difficulties that we prefer to avoid. This includes pumping, weight and bulk (can't carry multiple kites while touring), difficulty repairing in the field and for many who use them, the need for assistance while launching and landing. We teach kiters how to be self sufficient and foils are a large part of being self sufficient. HWK understands that everyone has a preference and people choose what they are most familiar with or already own. Our choices are based on what we've found to work best here for the local kiting community over the last decade. Bear in mind, winter winds have a lot more power than summer winds as cold air is much denser than warm air. Add this to the fact that even deep snow has less drag than water, your size choices may need to be stepped down from what you would use in a given wind speed in warmer months. For more information on gear choices please visit our "Recommended Equipment" page. Lessons can be purchased and scheduled on-line in the Lessons section of this website. When purchasing the lesson simply specify in the notes section the date you would like the lesson to take place and we will let you know if that date is available as well as potential back up options. All lessons are scheduled on a "First come, First served" basis. Weekends tend to fill up quickly and there is more availability during the midweek. In very rare occasions lessons can be cancelled and rescheduled by HARDWATER KITING in the event that wind or surface conditions are not sufficient or safe for a lesson to take place. But this is very rare. If you have a specific lesson date in mind please contact Hardwater Kiting prior to making your on-line lesson purchase. Hardwater Kiting is based in North Conway NH, located in the Mount Washington Valley and literally surrounded by ski areas, other winter activities and tourism opportunities. In the event that the wind doesn't cooperate we can hold the non-wind dependent parts of the clinic on site while waiting for wind and reschedule and finish the rest of the lesson at a later date. Worse case scenario we may postpone the lesson for the day. In the rare event that we are unable to complete your chosen level of instruction before the end of the season we will credit you for instruction for the next season.